I’ve known him for many years. He has always been huge, such a brawny guy. He used to come to our office with those huge hands and huge nose and kept joking, all the time. Afterwards he always flew to Libya or Haiti or somewhere else in the world, to help those who have just lost everything – becasue of war, of an earthquake, tsunami or any other humanitarian catastrophe. I’ve been always wondering how come he keeps joking all the time. How is it possible? How can one be able to watch so much suffering and stand it all? Be able to joke? Come back and behave normally? Simply business as usual. One day I came with this idea that maybe it’s becasue he is so huge and if you are such a huge person then you also have a huge heart and huge space in it for everyone, for all the people of the world. Because Rafal’s first love are people. 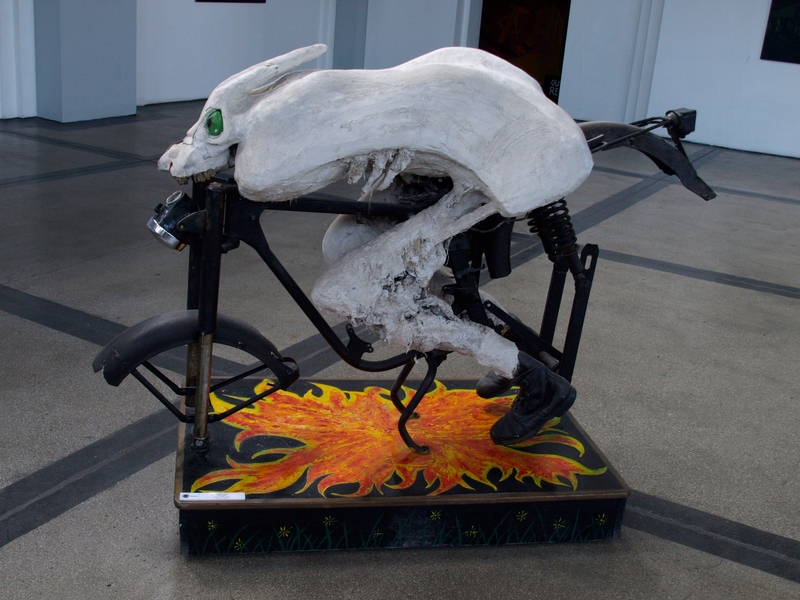 “Leave the bike in the garage and come home, I will show you everything”. So we did. “Are you hungry? Wanna drink something? Tea? Coffee? Water? Stewed fruit?”. “Stewed fruit!” – I answered excited. 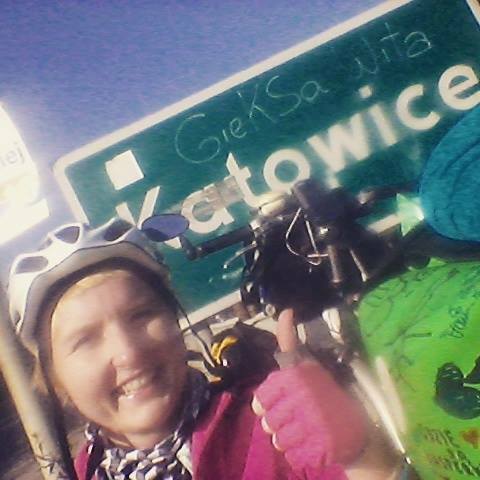 Yes, it was Agata who started this tradition that has been continue the whole long way over Poland. “I also made the dumplings with potato&spinach filling”. Oh, with every sentence I liked my stay in Grojec more and more! The rule that you need to invest in time when you want to get to know each other better has been confirmed again. I planned to stay there only one day, but I decided to prolong it becasue I could see that we slowly staretd to like each other and the only thing we still need is time. 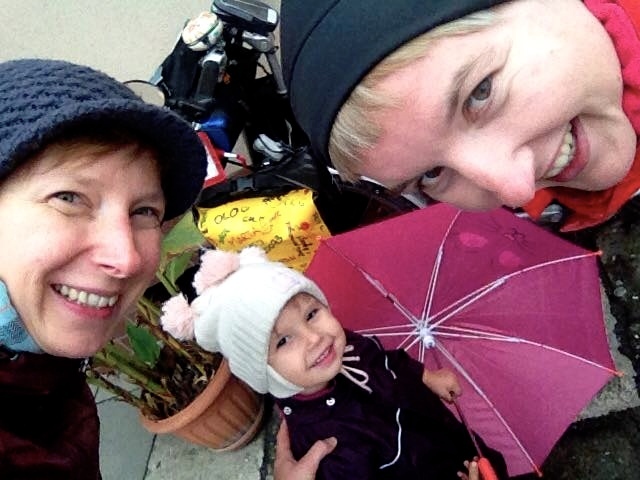 We’ve talked a lot, I used to make shopping from time to time at Miriam – two-and-half-years-old daughter of Dagna and Dominik that have hosted me that time. Their home gave me a lot of peace and safety. And this fragrant bedclothes – Agata was right when she said that home is where the fresh bedclothes are. My stuff (including my sleeping bag) already started to have the smell of the journey – this very specific smell of things that stay stuffed inside a backpack (or in the bike bags in my case) for weeks or months. Yes, fragrant bedclothes – this is really something! 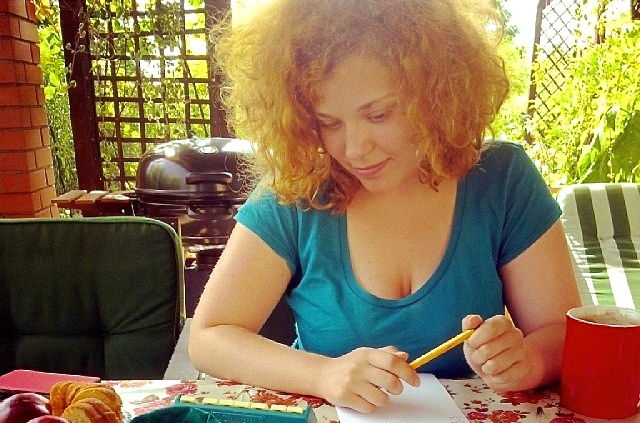 The first evening Dagna backed delicious pumpkin cake, so I baked my famous carrot cookies the next day. And Dominik prepared filled chocolates by himself. I have to say that I will remember Czyzowice with amazign food, kids and a lot of joy. And Dominik says that home is where your family is. It means also a place for him, but only a place, where the family is. Ps. Agatka asked me recently if I’m ready for the Czech Republic. Not that I meant someting, but well.. 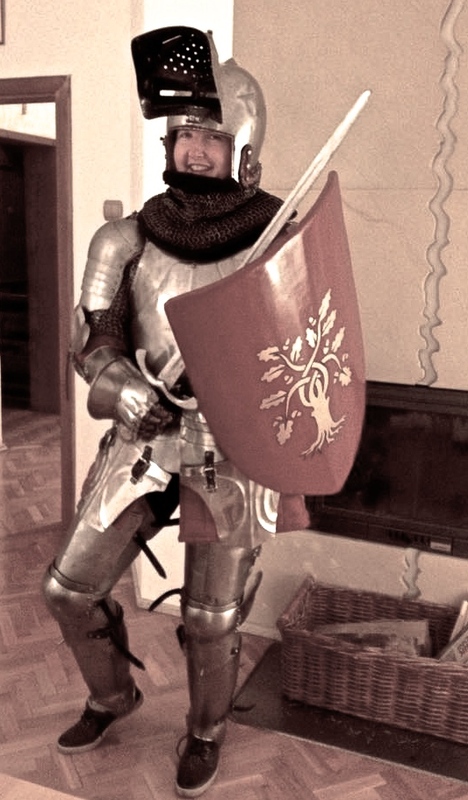 I guess I am ready 😉 Thanks Dominik for getting me dressed in the knight’s armour – it’s been something REALLY interesting! It was pretty quiet 60 Km. And although the weather has improved – as expected – it was still quite chilly, so I made quite many, but relatively short breaks (it’s so much easier to challenge cold when moving). No wind though luckily. And definitely the most misty day since I started..
Czyzowice – here I come! How to cycle this tree around? It turned out that Agata decided to visit her parents over the weekend. 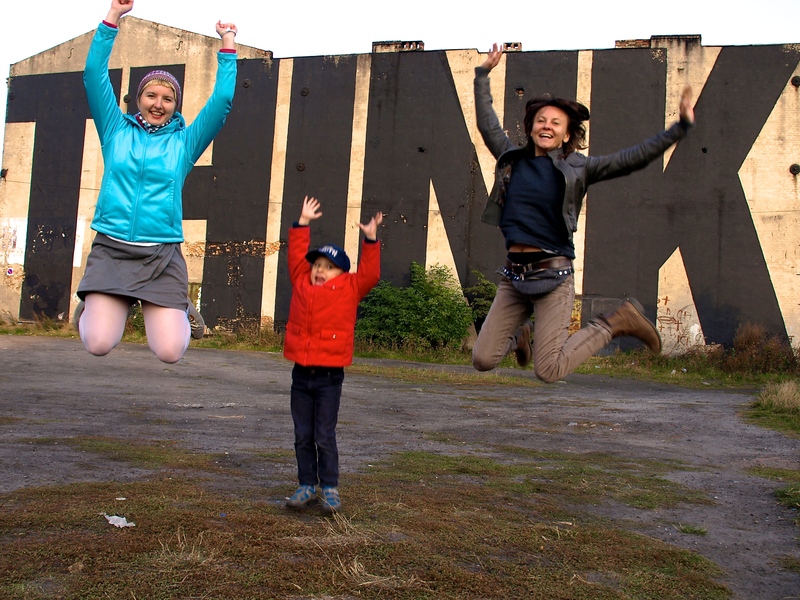 And she invited Maja with Marek and Ania with Dawid to join her. It looked like the last meeting with the friends in Poland, so how could I not come? 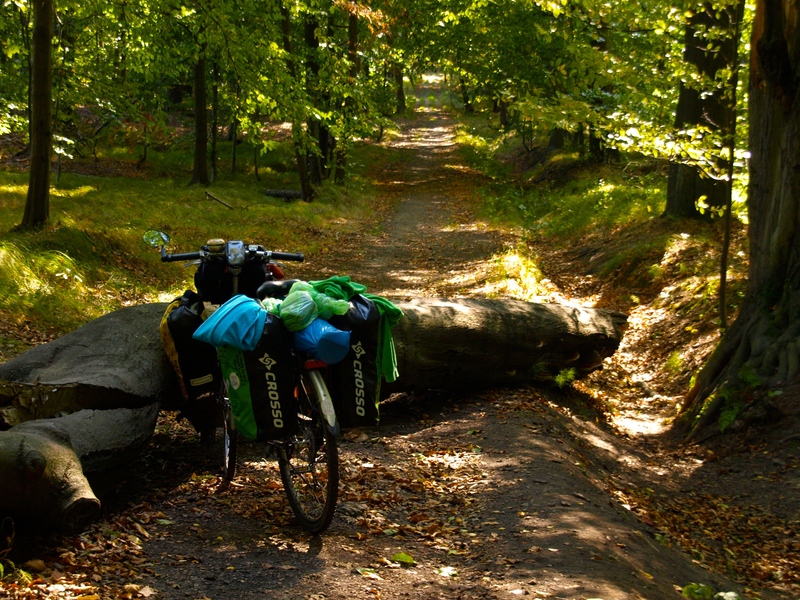 I decided to cycle back to Miedzyrzecze. This time, however, I wanted to try something new and I followed the navigation only. Yeah, that was a day full of creativity.. On the other hand – looking outside the window today, I guess that was no the most difficult one of my bike adventure! Hey forest! Nice to meet you! The day started with plum jam pancakes (Rafal hoped I’m going to forget it, but no way!). And it turned out that is has been the best plum jam in the world, cooked by Rafal’s mum! With the huge plum pieces inside. Soooo yuuummmyyyy! The main point of the day, however, was a bike photo session with Peggy, done by Ania. Photo sessions are always stressfull for me. Always. Although I know that I’ll be happy afterwards (becasue of the spectacular effects when having the pictures of you taken by a professional). Ania was amazing. She made me feel ver yvery comfortable, so it was very easy for me to smile and laugh. Actually after a few hours I had pain in my jaw becasue of laughing so much. Thank you, Ania!! With Ania – the author of the whole session! After we came back, we’ve spent the whole afternoon with Rafal, talking about his company Plan Planeta, which I simply admire not only for the loveliest socks in the world Rafal has in his offer, but especially for his idea to support the projects in developing countries by sharing the incomes he gets. So remember: with every single thing you buy from him, you help a person in the world. Currently: a woman in the Ukraine. The loveliest socks in the world! It was a day that brought the clarification of my weekend plans (forest again!) and some confirmations of the plans for next days: I already knew where I was going to stay in Gorzyce (my last stop in Poland – with Dominik and his family) + in Olomouc (Jiri) and Brno (Ladislav & Jana) in the Czech Republic. Having known that I kept sending CS requests to Ostrava and Breclav hoping for some positive answers. And on Wednesday they came: Vitek answered that he and his cat Monty will be happy to host me in Ostrava. Which means only Breclav left for now! The rest of the day we’ve spent with Rafal continuing our discussions about Plan Planeta and then eventually late in the afternoon we went for a bike ride to Silesian Park (Park Slaski) – one of the biggest city parks in Europe (as Rafal says), which connects three cities: Katowice, Chorzow and Siemianowice Slaskie and is of some 520 ha (or 620 ha) big. It’s called the Green Lungs of Silesian agglomeration and is also the cultural center of it. It’s been founded in the 50s, mainly on the postindustrial territories. Some of the main attractions of the park are (besides – of course – it’s size that allowes for great bike rides! ): Elka – the cable railway above the park that allowes to watch the park from the sky view; Planetarium – the biggest and the oldest one in Poland; Rosarium – the biggest rosa garden in Poland; the Giraffe Sculpture; Zoological Garden (I’ve seen flamingos!) – but the zoos always make me feel quite sad, so I would skip this one in the future; Silesian Stadium (huge, I have to admit) and the “Drone” piece of art, which is a huge sculpture in the form of a mosquito that consists of two parts: live view and the live view online. So we watched ourselves live and live at the same time! The picture from the “Drone” live! Another day of so many good news! Martina had answered from Breclav (yay! ), I created a list of ideas for Plan Planeta which Rafal liked (yay! ), he agreed to take me to Nikiszowiec (yay yay yay!). And Nikiszowiec is a place I’ve been to many years ago (also with Rafal), but I remembered that I really really liked it and I really really really wanted to go back there. It is currently a regular district in Katowice (since 1960), but it’s been originally built as a housing estate for mine workers at the territory of Gieschewald (Giszowiec) in 1908-1918. The architects – authors of the concept were Emil & Georg Zillmannow from Charlottensburg (in Berlin). The name Nikiszowiec comes from the nearby mine shaft “Nikischschacht” and is a Polish language version of it. The first houses (called “familok” in Silesian language) were finished in 1911. The construction of the district’s central building – St Ann’s Church started in 1914 but was stopped becasue of the beginning of the 1st World War, similarly to the whole estate’s construction, so the last building was finished only in 1919. After the war, when Poland re-appeared on the map and the borders were not strictly re-shifted yet, the Silesian region was also discussed about beloging. It was decided in the plebiscite in 1921 that it’s going to be attached to Poland, what happened eventually in 1924. Second World War brought similar turbulences, but after the war was finished, Silesia – and Nikiszowiec accordingly – stayed within the Polish borders. The estate didn’t have the best reputation until recently, mainly becasue of quite high level of crimes and unemployment. That has changed and Nikiszowiec has been turned into one of the Katowice’s tourist attractions. It’s also part of the Silesian Technology Monuments Route, since its creation in 2006. On the way to Nikiszowiec we stopped in the Gallery Szyb Wilson, where we have seen this piece of art and Rafal commented that this is how I’m going to look like, when I will eventually reach Istanbul on my bicycle..
And on the way back we stopped at the biggest mural in Katowice.. Think! 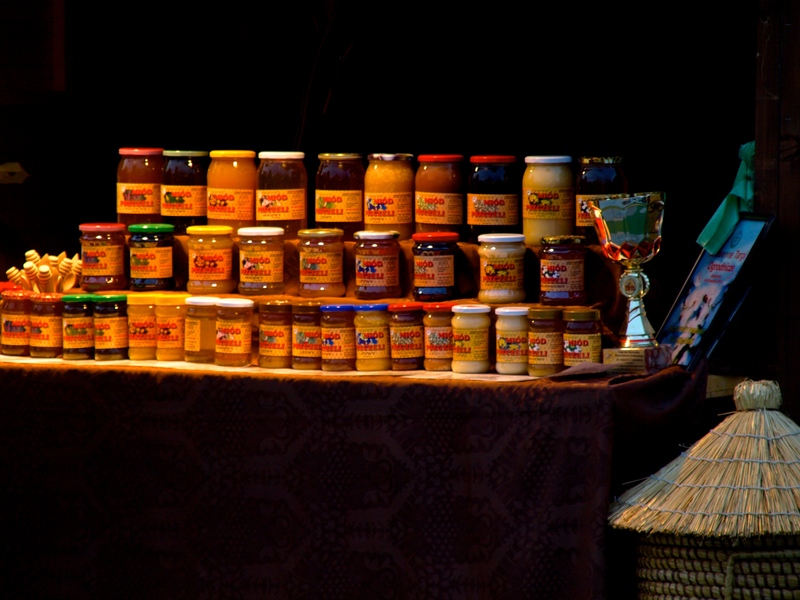 ..and at The Honey Festival! In the morning Rafal left to Warsaw and I stayed in Katowice on my own. I decided to visit the Silesian Museum, which has not happened – but I went for a bike ride around the city. The sun was beautifully shining and I just didn’t want to spend the day inside the buildings. I decided that there always has to be something to go back to! I have always been in love with destroyed buildings! And the buildings in the process of decay as well! My stuff is already packed and I’m ready to go to the forest for the weekend! That was a real bike adventure! Not the one like mine. Can you imagine that? Bike trailers made with their own hands, packed with stuff for the whole way. I can only try to imagine how it was like. Hard-boiled agges, preserves in glasses, probably a few loafs of bread packed. The whole instrumentation – gas cooker, pots for cooking. A tent, sleeping bags. Well, everything. And leaving Poland back then – that must have been so exciting. 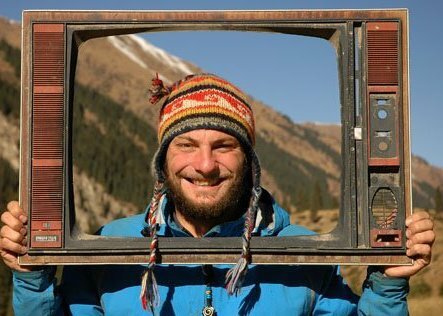 Rafal’s mum says that the longest bike trip – the one to Rome – lasted for six weeks. From Zywiec to Rome is about 1,5 thousand Kilometers. That gives some 500 Kilometers a week. Quite a lot, I would say. Quite a lot, especially when you ride an old Polish bike with old inner tubes, which break every few Kilometers. When the bike patches and the glue are of Polish, communist quality. When the hand-made bike trailers are rolling after the bikes. But I also think how much satisfaction must have been there. And how much joy! That reaching the destination must have really meant a lot. It has not been an adventure only but much much more. Such a real crossing of the borders, entering a completely different world. Rafal’s brother was 13 years old back then. I was 13 years old in 1996. And going abroad seemed to me someting unconquerable. What would it have to meant in 1980? Just have a look at those pictures! It was not an easy ride from Miedzyrzecze to Katowice. I mean, the first half (until Tychy) was. Agata’s dad – Wojtek had described me the route so well and had given me so many details that I was riding exactly according to his words. But it was only until I arrived to Tychy. The real story started only then becasue I found myself in the middle of the city. And riding through the cities is THE WORST. It’s not only about the enormous trafiic. It’s also about the road signs which say actually nothing. And it’s also about not having the city map.. So I actually really didn’t know where to ride to. I decided to stop at the bakery in Tychy to eat and drink something (kompot from Agata’s mum – Kazia, obviously!). And after the break I decided to use the navigation in my smartphone – for the very first time since I started this trip. So I entered all the data, chose the bike roads and started cycling. And what did the navigation do? It led me through the bike roads! But the nagivation didn’t take into consideration that I had some 25 Kilograms of stuff in my bags. No! The navigation decided that if someone is riding a bike, it surely means that the person is going to be very happy about riding through the forests, roots, ditches, railway crossings (thousands of them! ), ruts etc. etc. Which usually is.. But not this time unfortunately! This is how my bike ride through the Silesia, within the Silesian agglomeration looked like. Literally! I kept riding, a bit desperate, but more concentrated on avoiding obstructions on my way (like in Mario Bros – one of a very few computer games I ever played), patting myself on the back inwardly for buying the off-road tyres. 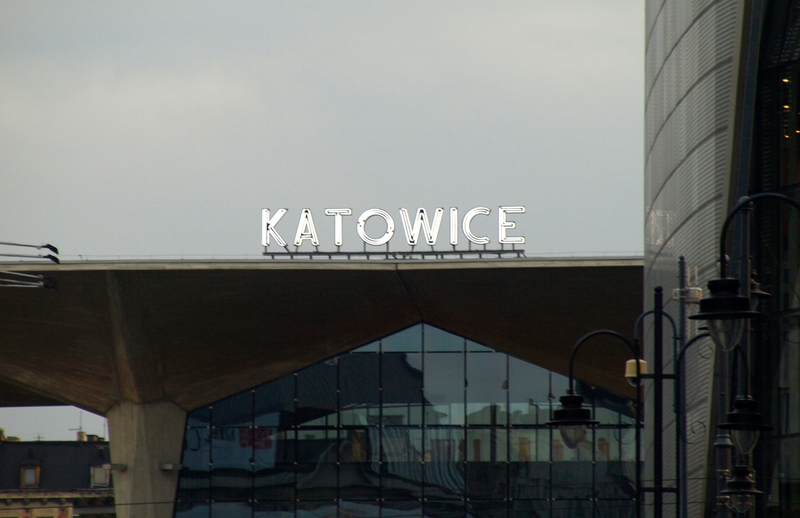 Until I eventually saw the sign “Katowice”. I couldn’t believe that! It was over! I did it! Of course it turned out that I was happy too early.. I looked at the navigation and it showed another 15 kilometres to reach my destination. The following road decided to look similarly to the previous one. Additionally the battery went off and at certain point I really didn’t know where to cycle to. But I eventually somehow managed – I knew Rafal’s address, so I asked some people on the road for the directions. I also passed through Muchowice airport, which I have only recognized after some time that I was actually crossing the place where Off Festival takes place. And it looked so totally different: between when the space was empty and when the same space was filled with some 15 thousands people. 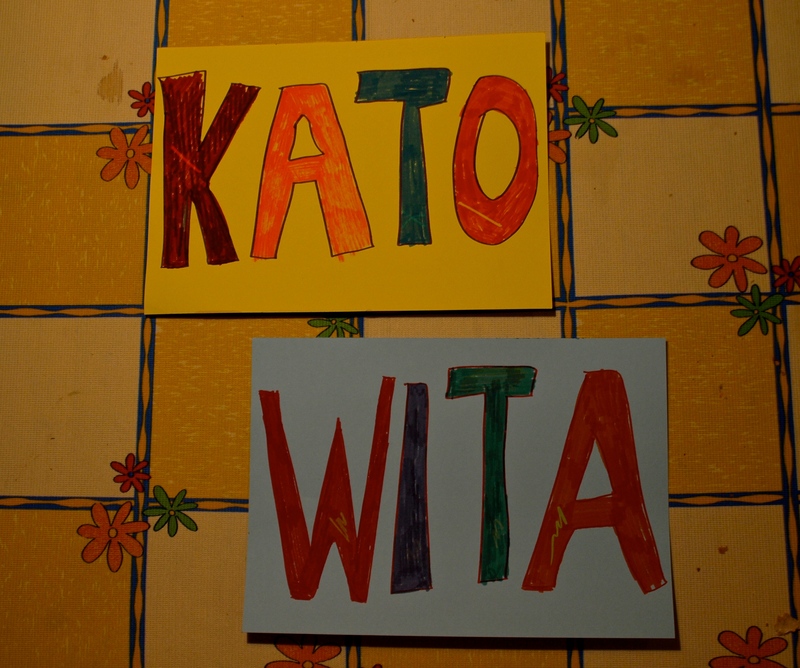 The sign: “KATO WITA” (“Kato welcomes you”) made especially for me by Rafal! How can one not love this city? !